The council wanted a gentler and more easily maintained alternative to the existing gravel ramp for the access path which is about opposite the Tutere Gallery in the beach domain. 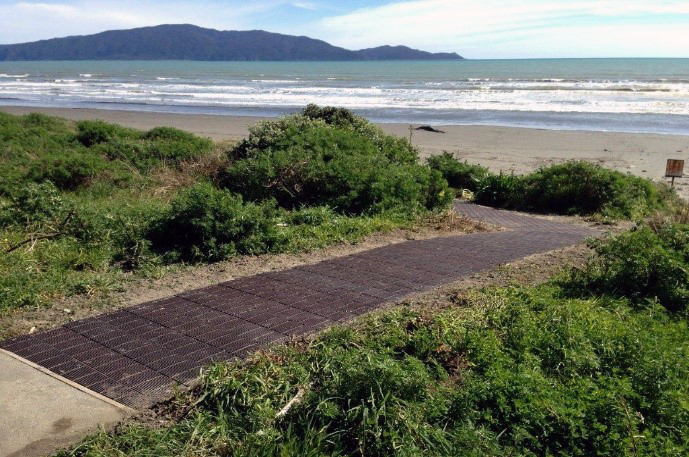 The new pathway is almost twice as long as the previous path, thereby reducing the gradient and making the beach more accessible for some users. The first pic is by the distributor for Replas of Australia in New Zealand, Metal Art, which shows the recycled plastic panels which cover most of it. The second pic shows Eva on the upper part of the path.